When someone wishes you “sweet dreams,” you can only hope that’s what they are when you crash your head onto your pillow. But more often than not, a creepy one slips into the mix. If you wake up in a puddle of your own sweat after a terrifying nightmare about clowns, or with a feeling in your stomach that makes you cringe after dreaming of falling into an endless pit, you’re not alone. 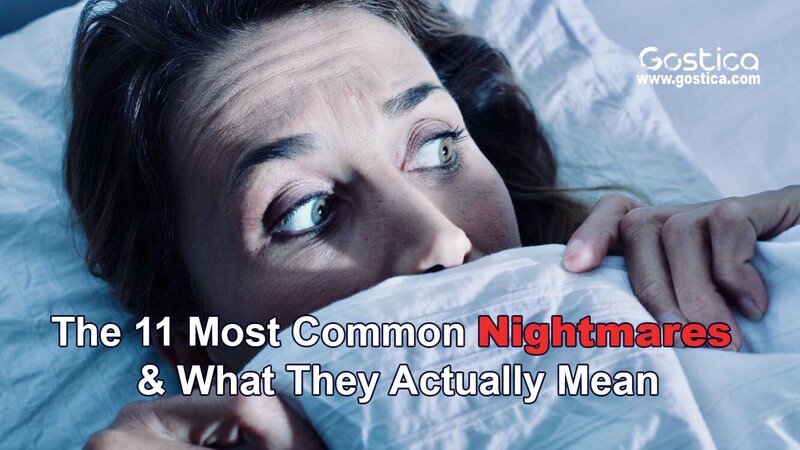 If you’ve had one of these common, creepy dreams and wondered what it means, good news: since the nightmares are pretty common, there’s a lot of information on why they happen! Also, dissecting the meaning of a dream can make for an ~eventual~ restful sleep. We’ve all been there. You’re strolling along in a field of flowers in an otherwise unassuming dream when, out of nowhere, you’re dropped into a whole other scene with a whole other vibe. There could be clowns involved. Or, maybe you’re falling and falling … and falling? Things can get creepy in dreamland! But it most likely is a compass for what’s going on in the real world, and figuring that out can help. Psychologists have linked the waking life to what happens in your dreams. And it makes sense: Your unconscious is being released in your sleep and you’re picking up on things that you weren’t savvy to in real life. Sometimes, this can manifest in nightmares. So, it benefits to knowing what exactly a dream is trying to tell you — at least for the sake of an actual sweet dream! Clowns are creepy. We have established this. To see one in your dreams might make you feel uneasy, and there’s a reason behind that. According to Dream Moods, “the clown may represent a mysterious person in your life who means you harm. It really depends on what kind of clown appears in your dream. Is it happy or sad? This will help indicate what feelings you may be ~feeling~. Not everyone is a fan of snakes. They slither, they hiss, they have fangs… it’s not great. So, to imagine you have one near you or on you could be pretty creepy. Apparently, when you dream about snakes, it “signifies hidden fears and worries that are threatening you,” according to Dream Moods. Your dream is telling to wake up. Not right at that second, because of sleep, but in your actual waking life. You should be alert to your surroundings. Hey, don’t be so hard on yourself! If you’re dreaming about falling, you might need to lighten up. Dream Moods explains that these dreams, “often reflect a sense of failure or inferiority in some circumstance or situation. It may be the fear of failing in your job/school, loss of status, or failure in love.” Yeah, it can be creepy to dream about falling into a bottomless pit, but, it’s worse to be mean to yourself in your real, waking life. If you ever saw the M. Night Shyamalan banger The Sixth Sense then the line “I see dead people” wafts through you like a haunting whisper. To see dead people in your dreams could signify, “that you are being influenced by negative people and are hanging around the wrong crowd.” According to Dream Moods, it really depends on who these people are. Do you know them? Are they strangers? Different meanings can be interpreted based on your relationship with the deceased who appear in your dream. Nevertheless, to have someone who has passed on making a cameo in your sleep can feel a little uneasy. And not to mention, emotional. This creepy dream about losing your precious teeth is pretty common. If you dream about the decay and loss of your teeth it could mean that you’re having some serious ~feelings~ and worry about a life change. It seems creepy. It might feel creepy. You might wake up gasping for air and patting down your entire body to ensure that yes you are still very much so alive. But according to Dr. Oz, this dream can be interpreted as positive. Yeah. Dr. Oz’s website explains, “they often are positive and may often mean that big changes are ahead. Death can be a symbol that you are moving forward toward something and leaving the past behind.” I guess that’s a good thing? Being naked in front of a crowd can be a creepy feeling. Nobody wants to expose themselves fully to a group of people — whether they know them or not. According to Dream Dictionary, this is a very common dream and can symbolize “shame with yourself” or feel “guilty in a situation.” Perhaps exercising the blissful art of meditation before bed to ward off anxiety dreams like this one. Nobody likes being chased. It induces that not so welcomed feeling of a pit in your stomach. But this dream is a common one for anxiety. Another dream indicating anxiety, the stress of not being able to control a car in motion could mean you’re also feeling out of control in your ~life~. Take a breather once you wake up, and perhaps make yourself feel like you’re in control. Even if that just means jotting down a list of things to do. This dream meaning is pretty intuitive. Getting an injury can feel pretty creepy in a dream. But while you’re totally fine, it could mean that you’re trying to heal. Quite possibly the most creepy of them all is sleep paralysis. It’s the still sleeping but awake out of body experience that will make you feel like you’re being haunted, or possessed. What feels like the worst night terror imaginable isn’t actually a night terror at all. It doesn’t actually symbolize anything and doesn’t worry you’re not being stalked by the supernatural.